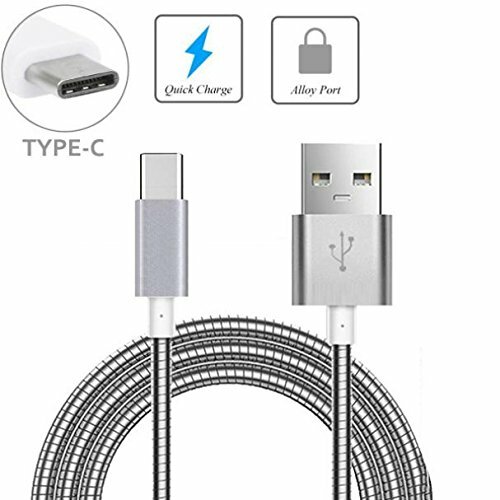 Durable Metal Braided Type-C USB Cable Charger Power Sync Wire Data Cord USB-C [Supports Fast Charge]. Sturdy Metal braided cable with reinforced aluminum connector housings resists wear and tear and kinking, much more durable than regular plastic cables. Measuring at 3 feet, this cable is long enough to charge your devices more conveniently and flexibly. Ideal for syncing and charging new devices with USB-C Connector. High performance metal braided cables use only the highest quality components. It Meets the Latest Specifications for Full Performance and Compatibility. The Cables are Triple Shielded for Superior Rejection of Radio Frequency and Electromagnetic Noise and Interference. Aluminum Plated Contacts Prevent Corrosion; Providing Long Life, and Ensuring Maximum Signal Integrity. Comes in Bulk Packaging (Non-Retail Package). 3ft Metal Braided USB Cable Charge and Sync Wire. Color: Metallic Silver. TYPE-C Connector for Phones and Tablets with USB-C Charging Port. Convenient Length: Measuring at 3 feet (1 Meter), this cable is long enough to charge your devices more conveniently and flexibly. Better and Stronger Cable: Sturdy Metal braided cable with reinforced aluminum connector housings resists wear and tear and kinking, much more durable than regular plastic cables. Metal Braided Cables are made with highest quality components, including nitrogen-injected, skin-foam dielectric jackets, for higher conductivity, longer life, and superior signal transfer. Comes in Bulk Packaging (Non-Retail Package). If you have any questions about this product by Neva Wireless, contact us by completing and submitting the form below. If you are looking for a specif part number, please include it with your message.